Rapid switches between high and low registers, impressive embellishments to the melody, unrivalled technical mastery: there’s a reason Lucia's show-stopping ‘mad scene’ is one of the most famous moments in all opera. These 'mad' scenes were nothing new in 1835, when Donizetti composed Lucia di Lammermoor, but he uses the dramatic story to show that Lucia’s mental collapse is the result of bereavement, betrayal and abandonment. This, and her tragic death, are the terrible consequences of what happens when a woman is pushed to her emotional limits. 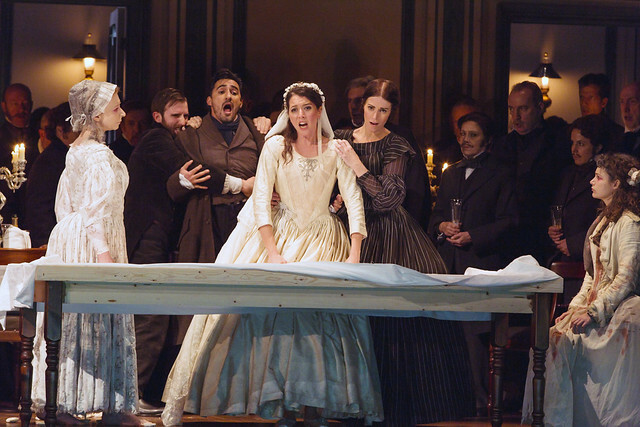 The famous scene comes in Act III after Lucia has emerged from her bedroom to confront her wedding guests, who have just been told she has murdered her new husband. Her story may not be a beautiful one, but Lucia is one of the great bel canto (‘beautiful singing’) roles. It is a wonderful showcase for the talents of the most gifted opera singers, inspiring such famous sopranos as Maria Callas and Joan Sutherland to some of their finest performances. In bel canto the virtuoso embellishments are often improvised by the singer – where Sutherland became famous for her ornamentations of the aria, Callas famously stuck close to Donizetti's original notation. The female singing isn’t the only supernatural sound: the 'mad scene' originally featured the eerie tones of a glass harmonica, that takes centre stage with the soprano in a haunting duet. For practical reasons, though, the part is more often played by flute nowadays but the effect is no less intense. There is great singing for the men as well. Enrico has a splendid cabaletta (fast aria) of vengeance in Act I, while Edgardo, the love of Lucia’s life, bids her farewell in a heartbreaking aria in Act III. The opera is rich in ensembles and choruses too – the most famous is the Act II sextet, in which all the characters confront one another and express their frustration at the course of events. And the orchestral score is rich in striking effects, including a dirge-like march with ominous drumrolls evoking the gloomy setting of the opera’s opening scene, the elaborate harp solo that precedes Lucia’s first aria, and the melancholy opening of the final scene of Act III, with sombre horns creating an air of gothic foreboding. Donizetti loved the gothic – indeed the opera is based on one of the most famous gothic novels, Walter Scott’s The Bride of Lammermoor, and retains many of the hallmark ingredients of the genre, including storms, ghost stories and, of course, the doomed heroine. Director Katie Mitchell shares Donizetti’s (and Scott’s) fascination with the gothic. Graveyards, ghosts drifting through a large manor house and uninhibited passions all feature in her feminist production for The Royal Opera, which puts Lucia at the heart of the tragedy. Lucia is presented as an independent woman, bullied to breaking point by domineering men. 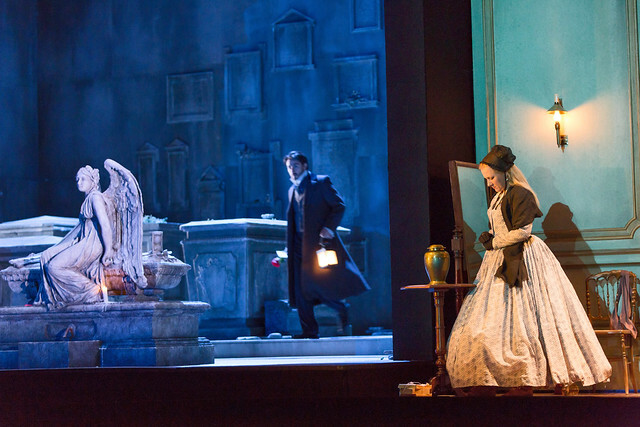 The production highlights the pressures on Lucia's mind: the death of her mother, warnings from beyond the grave, the complications of her love life, deception and manipulation by her brother and her lover, and the overbearing presence of the world at large (the chorus), who comment on and judge each stage of her story. Lucia di Lammermoor was a huge success when first performed in Naples and a French revision of it gave Donizetti the acclaim he craved in Paris, the most lucrative market for theatre at the time. Donizetti proved so productive as a composer that by the time he died aged 50, he’d written 65 operas (25 in one eight-year period alone) and his work became so popular there was a time when one in every four operas performed in Italy was by him. Of all Donizetti’s operatic tragedies, Lucia di Lammermoor, with its vivid heroine, beautiful orchestration, gothic story and psychologically realistic portrayal of a woman on the brink of collapse, remains the best loved and most performed. Lucia di Lammermoor runs until 27 November. Tickets are still available. Time to establish a post graduate course for opera producers. It's not good enough to bring in a theatre director who imposes an agenda onto the musical and italian text, and may not have done enough homework, e.g. by reading Scott's novel. The feminist interpretation is very worthwhile if thought through alongside a rigorous and imaginative understanding of the work.